Warmer weather is just around the corner, and that means light, clean scents are too! The smell of orange is clean, zesty and bright, just in time for longer, sunnier days and more outside fun. 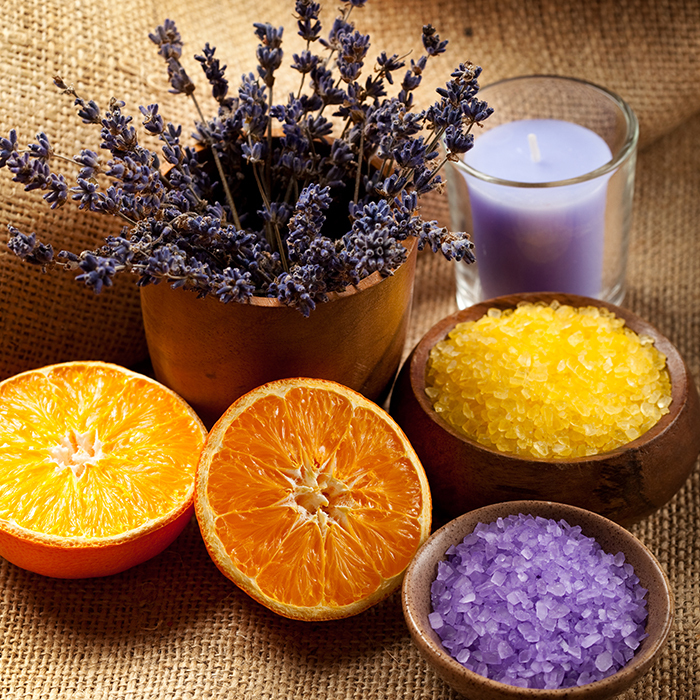 Lavender is a mellow scent, the perfect yang to the orange yin. Combined, these two fabulous fragrances make a sunny product that will help your customers get in the right frame of mind for the warm weather to come! The biggest difference between this scrub and a standard scrub is the base. 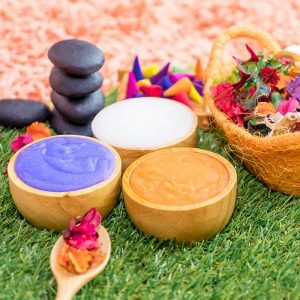 For this, we’ll be using a fabulous foaming bath butter that feels luxurious and smooth on the skin, and makes a great vessel for whichever exfoliant you use! The thick consistency and application of the final product makes for a skin-loving experience that is just a level above a standard scrub. Formulating a scrub takes only a few minutes and produces a great product that consumers just love. Obviously, one of the most important parts of a scrub is the exfoliant you choose, and this will depend on a few factors. Brown and/or white sugar is great for a more gentle exfoliation. Fine white sugar particles are perfect for a facial scrub, while large brown sugar granules are lovely for the body. Salt is also wonderful in a scrub, but best for the body and not the face. Salt can be more abrasive and is wonderful for rough heels or patches. Coffee is also a great exfoliant, using coffee grounds can add a great scent and course exfoliation to your scrub. Once you’ve picked an exfoliant, the amount you use will depend greatly on the level of exfoliation you’d like. More exfoliant will mean-you guess it- a more aggressive exfoliating scrub. Less will be more gentle, but possible less effective. Consider how you plan to market your scrub and how you hope it will benefit your target consumer and work your formulating magic from there! There are many different oils you can choose from when making your scrub; avocado, olive, sweet almond, any oil you like can be used! The same goes with fragrances; just be sure that what you’re using is skin safe. Today we’ll make a small batch to get us started! Step 1: Whip the Whip! Measure your foaming bath whip into your mixing bowl along with your sweet almond (or other) oil. Using the hand mixer, beat the whip and oil together until the whip is fluffy and even in texture-you won’t want any lumps. Step 2: Give it Some Sugar! We used fine white sugar for this recipe; add your sugar in four parts and stir between adding to incorporate the sugar evenly into your fluffy whip. The point is to coat each granule, so be patient and mix well! We ended up using about 1 ¼ cups to make a gentle scrub. Step 3: Time for the Pizazz! Add in your lavender and orange oils, stirring and folding to make sure the scent is completely incorporated. Now, use your spatula to fill your awaiting containers and sprinkle a bit of dried lavender buds on top; now you’ve got a beautiful, fluffy white scrub! Of course, you can add mica or other approved colorants to the scrub if you want something brighter; but this fluffy white scrub looks and smells like a summer cloud! Typically, you’ll want to add a preservative to products that will be repeatedly exposed to water and then sealed, but foaming bath whip usually has a preservative in it. Make sure to check with the manufacturer to be sure, and add a preservative at the recommended usage rate if needed. Scrubs are a great add on product for your line and are easy to make; the best part is, they are entirely customizable! We’d love to see what you create; show us your lavender and orange scrubs so we can get in the warm weather state of mind.